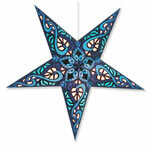 Star lantern special: Orders over $50 ship free. Via USPS Priority Mail. Expect your order to arrive in 3-5 business days after it ships. Standard shipping by Priority Mail starts at just $6. Fedex expedited shipping also available. We ship within 48 hours of receiving your order. Orders often ship the same day we get them. Call us toll-free at 888-241-7807 with questions or to place your order. We offfer a no-questions-asked return policy. If yo don't like it, send it back and we'll refund your purchase price, less shipping charges. We offer several illumination options, including battery powered LED lights. All electric cords are sold separately. 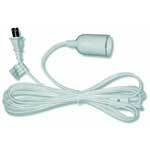 Our 12' hanging lantern cord has an on/off switch and a standard polarized plug for US and Canadian electric systems. Perfect for all our hanging star lamps, star lanterns and paper lanterns. Made in China. Shipping is very affordable via USPS Priority Mail. Orders over $50 ship free by Priority Mail! Need it faster? We also offer expedited shipping options.